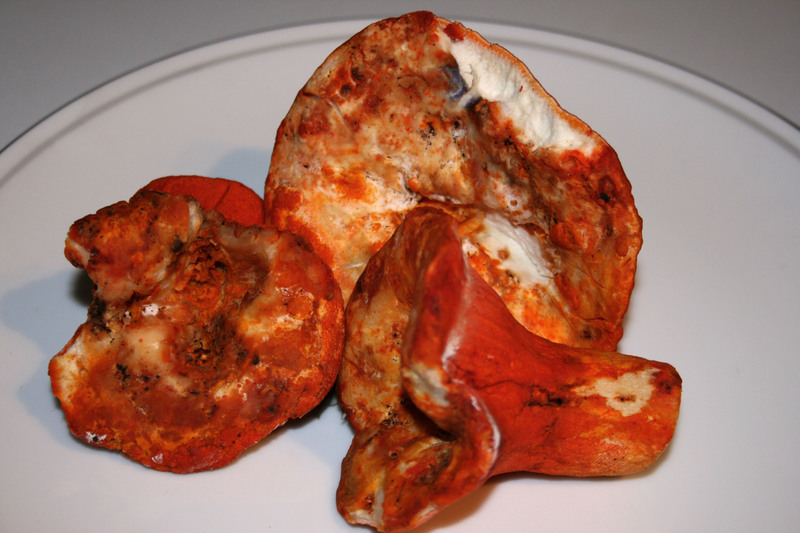 Mushrooms infected by parasitic ascomycete fungus….my favorite!!! OMG…. Heaven in a bowl!!! I seriously couldn’t get enough of this stuff. When are we going mushroom hunting again??? Unfortunately lobster mushroom season is slowly coming to an end in the Pacific Northwest. This was my first season going mushroom picking and we had such a great time wandering in the woods! None of us got lost and we had a great haul (although we didn’t really get any of the really large chanterelles). We collected tons of yellow and white chanterelles, lobster mushrooms, and chicken of the woods. We pretty much ate mushrooms everyday of the week and we still have chanterelles in the freezer. The lobster mushrooms were definitely my favorite, but we had fun with the chanterelles and chicken of the woods too. We made this lobster mushroom bisque from One Tomato Two Tomato with only a few changes… mostly just to accommodate what we already had in our kitchen. 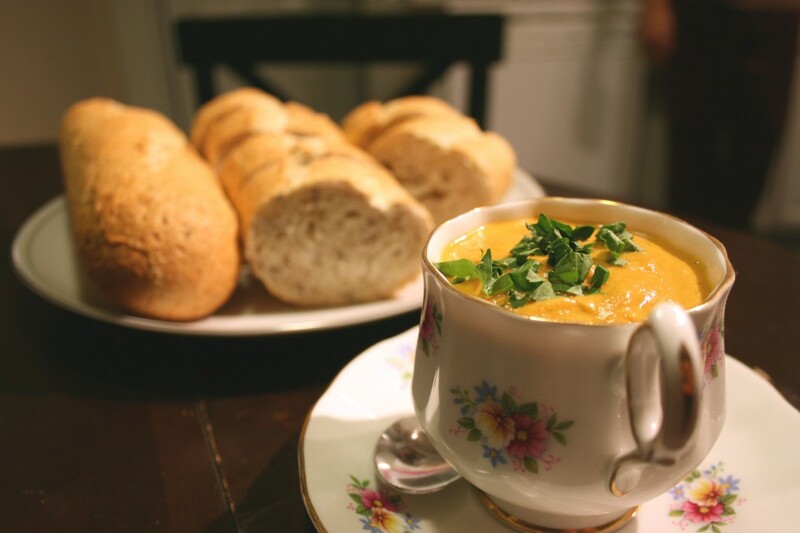 The bisque turned out fantastic! You would never know that their weren’t any real lobsters in it. Steve and I both went back for seconds! And the leftovers were quickly gone! 1. In a large soup pot heat the oil and butter on medium high heat. Add the mushrooms and cook until all of the moisture is released and the mushrooms begin to brown. Then add in the shallots, onion, carrots, celery, and garlic and cook for approx. 15 minutes, or until the vegetables are cooked. 2. Stir in the tomato paste until mixed well. 3. Deglaze the pot with the vodka. Use a spatula to scrape up any bits stuck to the bottom. 4. Bind the parsley and thyme together, add the bay leaves, wine and broth. 5. Simmer for up to an hour, allowing the mushrooms and vegetables to become soft. 6. Remove the bay leaves, parsley and thyme and then puree the soup in the blender in batches. 7. Add the puree back to the pot, add the heavy cream. And simmer for a bit longer. 8. Garnish with chopped parsley. Note: We served ours with a crusty bread from the bakery and it was perfect.